Lucy Richardson is a bilingual, bicultural immigrant to the US from Mexico. Before she arrived here in 1999, she was the administrator of a radio station and Personal Assistant to both the owner and News Director. 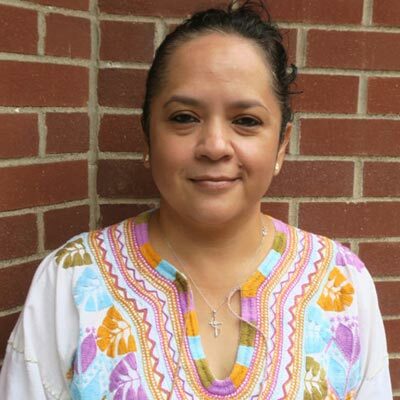 In the US, she worked in manufacturing jobs, and for Hiawatha Valley Adult Basic Education as the organization’s Hispanic liaison. In 2010, she began volunteering at Hispanic Outreach of Goodhue County, and by the next year, had become the Executive Director. This small but very active agency serves Goodhue County’s rapidly growing Hispanic population and is the only organization between the Twin Cities and Owatonna/Winona providing greatly-needed, Hispanic-specific services. Lucy is energetic, passionate about her work, and loves a challenge! Williams is a DACA recipient brought to the U.S from Mexico at the age of 9. Although he struggled with the language initially, he has been an interpreter for both his family and professionally since the age of 10. Williams’ first glimpse of Hispanic Outreach’s work was during a pilot trip to Washington D.C. in 2013. There was not another contact with the organization until four years later when he applied for the Administrative Assistant position at Hispanic Outreach. Then, he fell in love with the work and enjoys waking up sure he’ll get to make an impact every day in his new position as Program and Services Coordinator. Cella volunteered as a tutor with RISES in the winter of 2017 and is thrilled to be working more closely with the project. Outside of her work at HO, Cella is a vegetable farmer with her husband in Wisconsin. Since starting this position, Cella has greatly enjoyed getting to know the students and parents at the High School and Middle School and working with the tutors who generously volunteer their time to help those students with their work. She strongly believes that HO is an incredible resource for this community, and is honored to be a part of it.